When it comes to investing in the resource sector, investors have many options choose from. One of those options is uranium investing. Before diving into uranium investing, it’s worth taking a look at what makes uranium an important commodity in our day-to-day lives. Here’s a brief overview of what uranium is, what it’s used for and why so many investors are interested in uranium investing. Uranium is a fairly common metal, and occurs in most rocks in low concentrations of 2 to 4 parts per million. It even occurs in water, making it more common than gold. Uranium was discovered in 1789 by Martin Klaproth, a German chemist, in a mineral called pitchblende. It was named after the planet Uranus, which had been discovered several years prior. Uranium, when refined, is silvery white and weakly reactive. It reacts with most non-metal elements and their compounds, except noble gases. The metal’s reactive properties increase with temperature. Naturally occurring uranium is found in two different isotopes: uranium-238 (U-238), which accounts for 99.3 percent of uranium occurrences, and uranium-235 (U-235), which makes up the remaining 0.7 percent of uranium instances. Of those two isotopes, U-235 is the most important. U-235 is the uranium isotope most commonly used in nuclear fuel. That is because is U-235 is fissile, meaning that under certain conditions the isotope can be split, creating a significant amount of energy. Unlike U-235, U-238 is fertile, but not fissile. That means it can capture one of the neutrons flying around in the core of a reactor, creating plutonium-239. Plutonium-239 behaves very much like U-238 insofar that it is fissile and gives off significant amounts of energy. The most significant use of uranium today is in nuclear power generation. The first commercial nuclear power stations started operating in the 1950s. Today there are over 400 commercial nuclear power reactors in operation, providing more than 10 percent of the world’s electricity without carbon emissions. Uranium is also used by the military sector, particularly in high-density penetrators. This ammunition uses depleted uranium alloyed with 1 or 2 percent of other metals, like titanium and molybdenum. Depleted uranium is also used to harden armor on military vehicles. Probably the most prevalent use of uranium in military applications is weaponry, specifically nuclear bombs. That was one of the first uses of uranium before electricity and radioisotopes. However, since the 1990s, most of military uranium has been repurposed for electricity-generating purposes. Radioactive isotopes are also an important use of uranium. With a foothold in the medical, industrial and agricultural sectors, radioisotopes play a bigger role in daily life than many people realize. With the global population growing and undergoing continuous urbanization, the need keep the lights on is more important than ever. It is expected that by 2030, electricity consumption will have doubled from 2007 levels, with a significant portion of that stemming from nuclear power. In fact, China alone is constructing between six and eight new reactors this year, and the country plans to get five up and running as well. Over 20 nuclear reactors are planned in Russia, including a new floating nuclear plant with two nuclear reactors that was launched earlier this year. Similarly, India has 22 nuclear reactors with seven nuclear power plants. Despite that growth, the uranium industry has struggled in recent years. The 2011 Fukushima nuclear disaster plunged the market into oversupply, and prices have been low ever since. To deal with the low price environment some producers have made production cuts or closed mines entirely. Many market watchers are optimistic that the oversupply situation will soon end, citing growing demand and shrinking stockpiles. 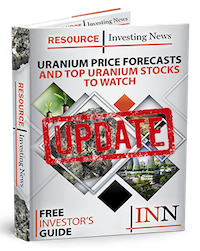 They predict increases in the spot and long-term prices for the metal, and believe these supply and demand fundamentals are what make uranium investing an attractive prospect. Now that you know a bit more about the energy metal, would you consider uranium investing?